This weekend my competition features a new publication by British composer Olly Wedgwood. 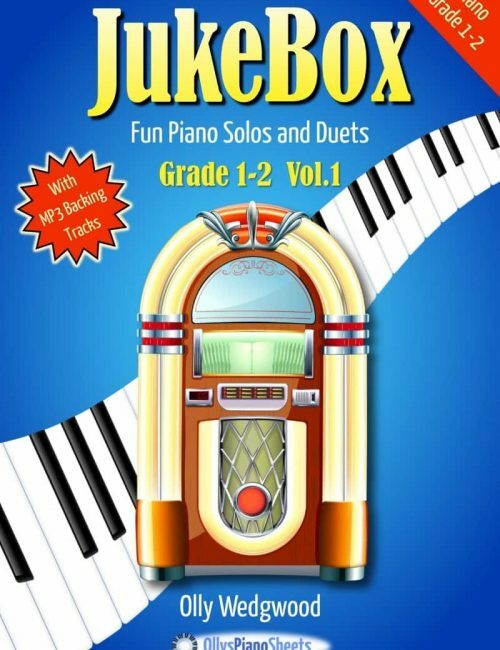 JukeBox: Fun Piano Solos and Duets (Volume 1) is a colourful new volume containing 10 original piano pieces, all published by Olly’s own publishng company, OllysPianoSheets. Intended for students between Grade 1 – 2 Level (ABRSM), the 10 pieces can be accompanied by performance and backing tracks, which are downloaded as mp3s from Olly’s website. The pieces all contain Olly’s musical hallmarks, and comprise popular styles from jazz and blues, to swing and soul. Olly suggests the pieces are for those who have been learning the piano for around a year, and he provides a helpful sentence or two at the top of each one with practice suggestions. The final two works are duets, and my favourites are Silver Lining and Pentatonic Prairie. I have two copies to give away to two winners, so as usual, please leave your comments in the comment box at the end of this post and I will select the winner on Sunday evening (British time). Good luck! Sounds like a lot of fun. A great new resource. I would love to win this to add to my teaching library. This is awesome! I love Olly’s music. I just went to Olly’s site and listened to them all and this is JUST what I need for some of my guys!